Sultans, spices, and tsunamis: the incredible story of the world's largest archipelago. Indonesia is by far the largest nation in Southeast Asia and has the fourth largest population in the world after the United States. Indonesian history and culture are especially relevant today as the Island nation is an emerging power in the region with a dynamic new leader. It is a land of incredible diversity and unending paradoxes that has a long and rich history stretching back a thousand years and more. Indonesia is the fabled "Spice Islands" of every school child's dreams—one of the most colorful and fascinating countries in history. These are the islands that Europeans set out on countless voyages of discovery to find and later fought bitterly over in the 15th, 16th, and 17th centuries. This was the land that Christopher Columbus sought, and Magellan actually reached and explored. One tiny Indonesian island was even exchanged for the island of Manhattan in 1667! 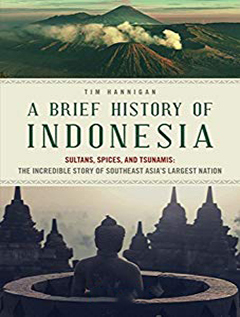 This fascinating history book tells the story of Indonesia as a narrative of kings, traders, missionaries, soldiers, and revolutionaries, featuring stormy sea crossings, fiery volcanoes, and the occasional tiger.